Shopping for guys is tough. Guy cards are tough, too. Maybe it is because I have all these pretty flowery stamp sets and cute little birdie sets. Maybe it is because the men in my family either have no hobbies or have really unusual ones - like being obsessed with pinball machines. Did Stampin' Up! ever make a Pinball themed set? I turned to Splitcoaststampers for inspiration and found a card I could CASE. The original used the Wanted set for the background. I used these paisleys by Paper Studio. Also I got to use some cool copper brads I'd had for awhile. I printed my greeting on the computer to give it an even more masculine image. Ink: Sage Shadow by Stampin' Up! Brads: Small ones are by Paper Studio. I can't remember the source of the large ones. 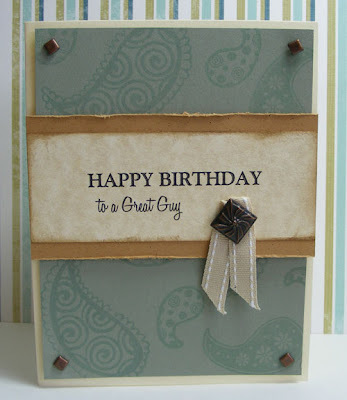 Ribbon: River Rock by Stampin' Up! All the papers are from my scrap bag.